Lemon Balm also know by it’s Latin name Melissa officinalis, is a perennial herb in the mint family Lamiaceae, native to southern Europe and the Mediterranean region. It grows to 70-150 cm tall. The leaves have a gentle lemon scent. At the end of the summer, little white flowers full of nectar appear. These attract bees, hence the genus name melissa. Melissa is Greek for honey bee. Lemon Balm grows best in a well-drained sandy soil. This versitle and delicious herb is easy to grow in the U.S. It will grow in zones 4 through 9. If you live in zone 4, you will need to mulch it for the winter. It is moderately shade-tolerant, much more so than most herbs. In dry climates it grows best in partial shade. 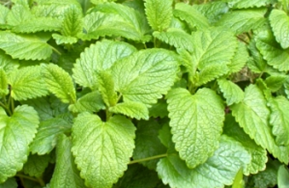 Lemon Balm grows in clumps and spreads vegetatively as well as by seed. Under ideal conditions, it will seed itself prolifically and can become a nuisance in gardens if not contained.